Cincinnati Circus a huge variety of ride and rental options for your next great event! Our selection of available rentals include - bounce houses, jumps, inflatable obstacle courses, inflatable water slides, giant games. We also have new mechanical rides and our exciting Zipline available. Cincinati Circus can also provide tent & P.A. rentals, a tables and chair rental service, carnival booths and any food or catering option imaginable! Our prices are competitive and can accommodate any sized event. When calling about our inflatable & ride rentals, be sure to also ask about our wide variety of carnival games, entertainment options, and our other great additions to any event! Our inflatable bounce houses are a crowd favorite for any event. What child (or adult for that matter) doesn't love to bounce around in a bounce house. Our bounce houses are secure, safe and most of all - fun! Our bounce houses range in size from smaller mid-sized to really, really BIG. We also offer package deals for larger events. Inflatable obstacle courses are a perfect rental for non-for profits who want to monetize their event. Inflatable obstacle courses have a very quick customer turn around. Whether you’re charging for the ride or just need a big bounce house they’re an awesome rental. Inflatable obstacle courses are for kids and adults! Our inflatable slide rentals are bright in color, attractive to the eye and always a crowd pleaser. It doesn't matter if your rental is for the backyard or a county fair, our slides are a must for any event! As always, we look forward to meeting your inflatable ride and event needs. 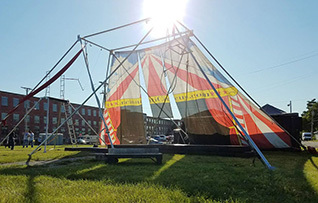 When you need an assortment of unique games and activities, look no further than the Cincinnati Circus Company. We have a huge selection of picnic and parlor games for your party or event! Some of most popular include out Giant variations of popular games and sports. Looking for traditional amusement park style rides, or maybe the thrill of a zipline? Our selction of mechanical rides will be sure to make your event or company picnic a smah hit. Perfect for city or county events and kind of municipal festivals! No event spectacle is complete without tents, tables and chairs. Cincinnati Circus can provide you with all your rental needs. We also have multiple food options, P.A. system rentals and carnival booth rentals. We can work out the details so you don't have to! Prom is the biggest event to happen at your school. Because a great prom needs a great after prom, we offer the best in after prom entertainment and activities. Cincinnati Circus can help with everything from theme, activities, games, entertainment and more! Visit our after prom page to see our featured available options, or call (513)921-5454 today!